Wired2Fish "Wacky and Neko Rigging Bass 101 [When and Where]"
"Mike "Ike" Iaconelli relies on both wacky and Neko rigging finesse plastics to get bit - they're arguably the most effective bass rigs for generating bites for anglers of all skill levels and produce even when fish are in a negative mood. Iaconelli shows us how to rig each, the differences between the rigs and when to fish them. The target now are both Northern Pike and sturgeon. Pike are staging for the spawn and are open all year long. Back bays are just opening up and will be full of pike soon. A combo of big dead baits or slow rolling a spinnerbait, spoon or crankbait will be the go to methods. Lake of the Woods has a very strong population of trophy class pike over 40" long. All pike 30-40" must be returned with a 3 fish limit and one over 40". "I had to get my licks in, long as almost everybody else was too. I’m referring to the great walleye bite on the Rainy River, which has now since closed and won’t open until the fishing opener on May 11. Sitting here, thinking that I’ll never make it up there this spring, a message popped up on my computer. Jesse Larcom was making the trip and wondered if I’d like to go along. Well heck ya! Count me in. Even though it was a last-minute offering, it didn’t take me too long to have things ready for the next morning. All that was need was a couple rods and some heavy jigs. On Wednesday, subscribers to the “Insider’s News List” received an email about some cancellations that I needed to re-book . I want to say thank you to everyone who replied, most of the dates are re-booked already and I really appreciate that! There were a few folks who emailed to tell me that they wish they would have gotten the email and asked why they didn’t? The reason is simple, we never add anybody to the email list unless they’ve asked to be on it. I know what a pain it is to sift through dozens of unwanted emails and that’s why we never share your information with anybody. The “Insider’s News List” is available for free to anybody who wants to receive it, but it is an “opt-in” only list. When you sign up, you’ll receive periodic notices about last minute cancellations and occasional important news stories about fishing. Whenever there’s a fishing report of special interest, you’ll get a reminder about that too. If you’d like to subscribe, just click here or on the image and in less than 30 seconds and you’ll be included. "It’s not too early to begin thinking of Minnesota’s general fishing opener, which is only four weeks down the road. I’ve been slowly readying equipment and am anxiously looking forward to it. So far, an equal amount of time has been devoted to fishing rods, tackle, and the boat. The first thing I do is check air pressure on the trailer tires. This is easy enough to do and can save you a little money in the long run. I learned this the hard way, wearing out a set of new tires in one summer. Yes, I fish a lot but certainly didn’t drive the miles needed to wear out two new tires. Jeff Sundin Fishing Report April 8, 2019 "Wet, Soggy, Damp and Soft"
Rain fell steadily on Sunday, small creeks filled with water as snow cover around Grand Rapids melted away. Another warm day today will move the needle even more and then Mother Nature is going to deliver a minor cold snap for a few days. That will help alleviate flooding, but it won’t be enough to re-freeze ice around the edges of the lakes. April 3, 2019 — "Post Walleye Spawn Behavior"
A) Joe, Ice thickness on area lakes now ranges between 20 & 26 inches, snow cover is almost completely melted and the surface of most lakes is now dry. So over the next few days, there will be plenty of ice out on the lakes. The only limitation will be ..." Read >> Can We Find Fish-Able Ice This Weekend? 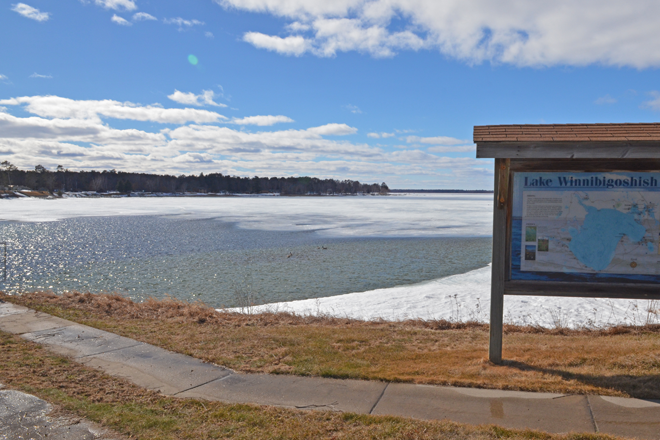 Lake Winnibigoshish — The Pines Resort March 29, 2019 "Ice Conditions On Lake Winnie and Cutfoot Sioux"
On Lake Winnie, some of the ice in our bay near the dam is too thin to allow even ATV traffic on to the lake, so we’ve closed our landing. But that doesn’t mean we can’t still get on the lake to fish. We’ve directed our customers how to access the lake using alternate routes that allow them to fish on Tamarack Bay. We know that there has been a lot of ATV traffic on the big lake, but to the best of our knowledge, nobody is driving pickup trucks out there. Jeff Sundin Fishing Report March 28, 2019 "Spring is Springing At The Rainy River"
It’s beginning to look more like spring at the Rainy River. Water is flowing past the landing at Birchdale and the county has had a crew working on opening up the boat ramp. There were already some anglers pushing small boats across the ice and on to the river this Wednesday. The probability is very high that it’s going to be open for all boats by this weekend. It will be interesting to see what affect, if any, the new catch and release only walleye regulation will have on traffic this spring. Wired2Fish March 29, 2019 "5 Inexpensive Lures that Catch Spring Bass Anywhere"
"As big bass vacate their offshore haunts and begin flooding the shallows in preparation for their annual spawn, anglers are afforded a special opportunity. These fish are hungry and territorial which means lots of bites and lots of size. Contrary to popular belief, you don’t have to spend a pile of money to catch these fish. These fishing lures will catch plenty of bass without emptying your bank account. "Ice - 30 to 34 inches of good ice is being reported on many of the area lakes. There is 4-6 inches of ice on top that can turn soft or slushy on warm sunny day stretches, but rock hard on days that stay below freezing. Travel is very easy overall and air temps will determine if it a truck, 4 wheeler or by foot is the best way to travel. Crappies - Interest in crappies has risen as spring like temps have come to the area. Reports have been hit or miss for many, but anglers that have stayed on the move and were able to locate crappies have reported some nice catches with some real slabs mixed in. Jeff Sundin Fishing Report March 28, 2019 "MN-FISH Sportfishing Coalition; Leading the Lead-Able"
Anglers need a strong, unified voice. At least that's what we need if we want our views to carry any weight in Minnesota’s legislature and at Minnesota’s DNR headquarters. That’s why I circled back around in the aisle when I spotted Gary Leaf working a booth, under the banner that said "Leading The Way To Minnesota's Fishing Future. "at the Northwest Sportshow. Under the banner, a logo for MN-FISH Sportfishing Foundation-Coalition. Leaf is respected as an advocate for outdoors issues in Minnesota. His group Sportsmen for Change was formed over a decade ago to tackle outdoor issues in Minnesota. Jeff Sundin Fishing Report March 27, 2019 "Late Ice Leech Lake Perch Fishing; Game On"
Wired2Fish March 27, 2019 "Advanced Fish Finder Steps for Finding Bass Fast"
"Pro bass angler Ott DeFoe breaks down how he uses a combination of side imaging, mapping and 360 Imaging to build a high-percentage milk run of spots before wetting a line. This is the exact step-by-step process that helped him win the 2019 Bassmaster Classic and it'll help you too. Jeff Sundin Fishing Report March 26, 2019 "Itasca Area Perch Fishing Getting Great Reviews"
On March 25, 2019 Mark Novara wrote; Q) Hi, looking at coming towards Winnibigoshish this next weekend. We live in upper michigan, are ice conditions ok? We are thinking of hitting Round Lake, or Pike Bay. Any information would be greatly appreciate. Thank you! "On the south end, good walleye reports for those still ice fishing. Good catches are coming everywhere from 15 to 31 feet of water. Gold, glow red and glow colors best. Mix up presentations, try rattle baits, minnow baits. Deadsticking plain hook with live minnow consistent. Pike action had been excellent with many fish over 40" caught again this week. More Itasca Area Fishing Reports! 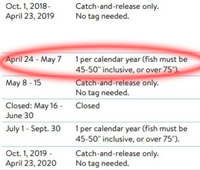 Are you sure that you really wanted to skip the link from the report at the top of this page, the one that says; "Itasca Area Perch Fishing Getting Great Reviews March 26, 2019"? If you skipped it, then you kept a whole bunch of secrets from yourself. That's because there were too many updates to list them all on this page so I bundled 'em together in the March archives page. "At Trails End Resort, Erin Charlton says; “It’s messy out on Bowstring Lake. There is very little snow cover left on the ice, but it is still very wet. I do see ATV’s and snowmobiles travelling around, but I think that ATV riders definitely still need chains. Track machines are moving freely from what we can see. The lake was freezing again overnight, making all kinds of noises, so conditions will be rough this morning. With daytime highs reaching only the high 30 degree range, the meltdown should now be slow, increasing the number of fishing days available to anglers. Greg Clusiau, "Greg's Guide Lines" March 25, 2019 "Ice Fishing As Good As It Gets"
Late ice fishing is about as good as it can get right now. My last outing consisted of me and my brother, Joel, using a snowmobile to reach a productive crappie spot. There was just enough snow to keep the machine all lubed up and running good. Now, lake conditions are favoring ATVs, as there has been a total meltdown and all surfaces are glare ice. It’s great travel and fish are being caught but make sure to wear ice cleats. It’s quite slippery out there. I’m home from the Northwest Sportshow at which several of you stopped by to inquire about whether or not you’d be able to make one final ice fishing trip into the area over the next week. I promised to gather some updates this week and I will, but generally speaking, I think you will be able to come. I already learned during the trip home that the snow cover in north central Minnesota isn’t gone like it was in the Twin Cities. But it has been greatly reduced and friends report travel conditions on the ice are improving daily. 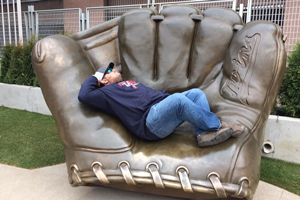 Jeff Sundin Fishing Report March 21, 2019 "Showing the Show-Able At the Northwest Sportshow"
Yesterday was the first day of spring, today is the first day of the Northwest Sportshow in Minneapolis and for me, the ice fishing season should be over; but I hope it’s not. It’s true that I’ll spend the next 4 days talking with folks about fishing lures and presentations for the upcoming open water season. But during that time, I’ll secretly be hoping that when I return home, ice conditions will be good enough to allow me a couple more “hard-water” panfish trips. Reports of improving ice conditions and decent fishing action are adding fuel to the fire, but first, I better pay attention to business and make sure that the 2019 version of the Northwest Sportshow is successful. You can help with that by coming down to the show and stopping by the Lindy Fishing Tackle booth #835. We’ll chat about some fishing strategies that will help you catch more fish this summer. "I’ve spent last two afternoons on the ice with snowmobile checking conditions and have been quite surprised how good conditions are. I’ve only run into one small area of slush and that was on south end of Bowstring where in last half mile close to shore the snow hasn’t settled yet but out on the main basin there isn’t much snow left and it’s beautiful conditions. The south landing road might become a issue quickly because of all the snow it has quite a base on it and is hardly plowed wide enough to meet in some places. The other lake was a small one but that also had settled down and frozen hard I could snowmobile or walk on top very nice. Snowmobile or tracked atv are going to be best for a few more days because of the snow around edges of the lakes getting soft in afternoon. "On the south end... Good reports for those still ice fishing in 24-31'. Gold, glow red and glow colors best. Try downsizing presentation. Deadsticking plain hook with live minnow consistent. Morning and evening bite continues in 15-20'. Pike action strong with many fish over 40" caught again this week. Some resort fish houses still available, many of the resorts are done ice fishing for the year. Lots of snow on lake, slush in spots, best to stay on resort roads or trails. Fish houses on ice through March 31, walleyes open through April 14, pike season open continuous. Auger extensions needed. Jeff Sundin Fishing Report March 15, 2019 "Wrapping the Wrap-Able on Lake of the Woods"
I’m back from Lake of the Woods and for me, the winter walleye fishing season is over. While I was storing the snowmobile and pull behind ice fishing shelter on Thursday, I ran mental images of the post season play-by-play highlights. We did have to do some extra travelling this winter to get away from north central Minnesota’s slush and deep snow. But thankfully, we were rewarded for driving all of those extra miles with lots of good fishing. Checking my messages yesterday, I found one from Alan Duit who wrote; Q) “Good morning. When you were fishing at Lake of the Woods for walleye, were you fishing just off the bottom or were you seeing the fish suspended 4-5 feet off the bottom? Jeff Sundin Fishing Report March 14, 2019 "What The Heck Is A Tungsten Fat Boy?" This morning on KAXE Radio's Morning Show, I mentioned that now is a good time to stock up on ice fishing lures that will come in handy later, during the open water season. One of the lures I mentioned, Lindy's Tungsten Fat Boy, piqued the interest of co-host, John Bauer. In response to his comments, I promised folks who were listening to the show that I would put up a photo of the lure, so here it is. While I’m at it, I’ll share the condensed version of my comments about ice fishing lures and why you should be stocking up on them now, while the ice fishing season is almost behind us. Wired2Fish March 15, 2019 "Target Pad Stems for a Spring Bass Fishing Bounty"
"Pad stems offer great bass fishing potential in the prespawn and spawn periods in the form of vertical cover in cold but warming waters. When anglers mention lily pads, they typically envision broad flats and ponds blanketed with greenery. But don’t overlook the dormant period when winter reduces the plants to their spindly stems. 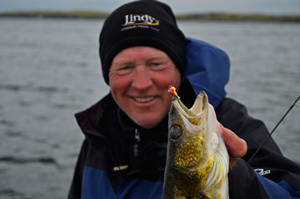 Jeff Sundin Fishing Report March 13, 2019 "Spring Sprung On Lake of the Woods"
For walleye anglers, Lake of the Woods is one of the few destinations available until open water fishing seasons begin to open. That combined with the fact that the south side of Lake of the Woods has escaped the huge problems with slush that have plagued lakes in many areas this winter, means that everyone who wants a walleye dinner has been fishing there. 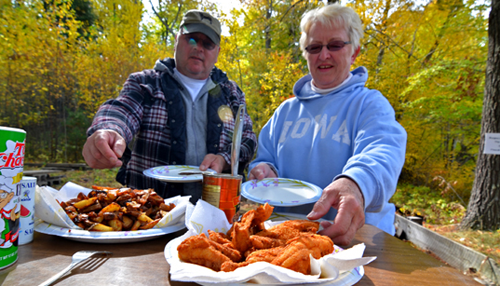 We’re just like everybody else, so when we wanted to gather some walleyes for a meal, we headed up there too. Friendly, is the best term to describe fishing conditions on Lake of the Woods this Tuesday and it was the first time in a long while that I’d use it. The sun was warm, the breeze was moderate and … I’d say it’s about time! Finally, a day spent outside, on the lake instead of being hunkered down inside a portable fishing shelter. "Lake Trout - Lake trout anglers have become few and far between as snow continues to pile up this winter. For many anglers heading out, they are limited to where they can fish, by where the road is plowed. Best reports have been coming from anglers fishing with snowmobiles. Main lake points, humps and saddles in 30-50 feet of water, have been producing lakers. Blade bait, bucktails and tubes have all been catching fish, but blade baits have really shined this last week. Stream Trout - Rainbows and Splake are showing up more in 15 feet of water or less. Some anglers have reported catching rainbows as shallow a 3 feet on one lake. Waxies, spawn bags or rippin raps have accounted for the majority of trout being caught. March 12, 2019 "Upper Red Lake Zebra Mussel Larvae Confirmed"
The Minnesota Department of Natural Resources has confirmed the presence of zebra mussel larvae in Red Lake in Beltrami County after studying samples gathered last summer by biologists from the Red Lake Nation. The DNR has been working in partnership with the Red Lake Nation for over 10 years to monitor zooplankton in Red Lake and will continue to work closely with the tribe to respond to this discovery. One of my recent trips had me trying my hand for jumbo perch. The weather, although not all that cold, wasn’t the best on this day, due to strong winds. It was brutal, trying to fish outside, without a shelter. Longtime fishing partner, Brad Brown, and I doubled up on my snowmobile and made our way to a proven big perch spot. The resort had closed the ice road to vehicles, because of deep snow, slush, and flooding, but it was open to foot traffic, snowmobiles, and atvs. I was a little leery, at first. Would we be getting stuck? Making our way onto the lake, I was delightfully surprised to find that we could ride on top of the crusted, hard-packed snow. Like a roller-coaster ride, we drove over numerous “snow moguls” as high as 4’. It was easy getting around. MN DNR Enforcement said that they sympathized with us about having such tough conditions on the ice this winter. But they have no plans to extend the March 18th ice shelter removal deadline in the northern zone. The way we look at it, we had to get it done sooner, not later because the job was only going to get harder if we waited. So we chipped away at clearing the slush and snow from our plowed roads and removed the last of our rental shelters this past Friday. Reader Comments March 10, 2019 "Clearing the Clear-Able"
Austin Jones has been catching everything from walleye to sunfish on Lindy Glow Spoons this winter. Reader Comments March 2, 2019 "A Better Understanding Of How Ice Melts"
On Friday "TR" wrote taking me to task about my comments regarding ice out. He says; “Ice decay is influenced by a whole host of climatic variables and physical attributes, including the angle of incidence of the sun, how much reflectivity is on the surface of the lake (snow vs ice), the amount of infrared waves that are absorbed by the ice that can be converted to heat, how much sun vs cloud cover, air temperatures, presence of currents, and a number of other variables. Jeff Sundin Fishing Report March 1, 2019 "Estimated Calculations Based On Educated Guessing"
On Thursday, Sheldon Mack wrote; “I share your thoughts regarding a relatively shallow ice sheet (Read Report February 28, 2019) under our current snow pack. But I wonder if you are giving too much credit to the shallow ice and the warmth under the ice while not giving enough credit to the importance of sunlight in regards to ice out dates. (The) long term forecasts for the Itasca County area show very few melting days in the next two or three weeks. I am not convinced that significant ice deterioration can begin until the snow is substantially reduced." Jeff Sundin Fishing Report February 28, 2019 "Predicting the Predictable"
Did you know that Grand Rapids’ average daytime high temperature for February is f 26 degrees? That’s what it says at the U.S. Climate Data Website and unless I missed something, the daytime high in Grand Rapids has never reached that “average” one single time this month. In fact I think it’s been below zero more than it’s been above zero. Personally, I don’t care that the weather has been cold; we have plenty of gear for staying warm. But what concerns me is that he slush on area lakes is spreading and the snow just keeps piling up. Unless the weather warms and this snow melt soon, folks are liable to miss out on some awesome, late winter ice fishing. February 4, 2019 - "Why Not Use Braided Line For Walleye Fishing?" A) Tim, there are many times that I do use braided fishing lines. My Musky & Pike rods are spooled with braid, so are some of my Bass rods and I do occasionally use braid for Walleye, deep water jigging for example. But 90% of my walleye fishing gear is spooled with monofilament line. For wiggle worming and most other shallow water jig fishing I use ..." Read >> Why Not Use Braided Line For Walleye Fishing? Wired2Fish November 28, 2018 "The Do-All Fishfinder Solution for Ice and Open Water"
"We take a detailed look at Humminbird's capable ICE HELIX 7 All-Season pack, which does true double duty as a technology-packed LCD ice fishing fishfinder as well as an open water unit. One box and all the accessories needed to make a seamless transition from soft to hard water and vice versa. October 12, 2018 - "Is The Arctic Armor Ice Suit Worth The price?" Q) On October 12, 2018 Bill Franzen wrote; "Jeff, I've got an ice armor suit that's about 10 years old. How would you compare the suit you're referencing in your report to the ice armor? 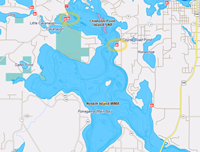 Jeff Sundin Fishing Report October 10, 2018 "Mapping the Mappable"
Given the recent weather, it's understandable that my phone isn’t exactly ringing off the hook. It takes a hearty soul to make a day on the lake fun right now and folks, who aren’t already on my calendar haven’t been in a rush to get in on this cold snap. Because I do still have a handful of trips on my schedule, I feel obliged to get out on the lakes and have a look around. The least I can do is to keep myself up to speed about lake conditions and hopefuly fish locations too. That way I have a fighting chance of making these next several dates fun for my customers. Crappies, Too Deep For Their Own Good! Be mindful about the pitfalls of fishing deep water panfish. During late fall and winter there are several species of fish that migrate into deep water. Crappies, one of the most popular deep water inhabitants, are particularly vulnerable to fishing pressure during this cold water period. Canton, Ill. — Jeff Kolodzinski is a man on a mission — a Marathon Man out to break a record he already holds. On September 11 and 12, 2018, at Giant Goose Ranch in Canton, Illinois, he will attempt to catch more than 2,143 fish on hook and line to break his own world record set in 2011. But Kolodzinski is not doing it for a spot in the record books. He’s doing it to introduce people and families to fishing and to increase awareness and financial support for the Fishing For Life, a non-profit, tax exempt charitable organization whose Next GEN program finds mentors for children of families in need. September 7, 2018 - "Tugsten Ice Lures, Select Colors and Sizes For Open Water"
A) Dave, Yes I do understand; nobody likes to stock up on fishing tackle that won’t serve the end goal of catching fish. Wired2Fish September 4, 2018 "How to Use Side Imaging to Find Hidden Spots"
"Side imaging sonar reveals an entirely new underwater world to anglers interested in learning the technology. It produces highly detailed readouts of the water column and bottoms off both sides of the boat; this has some major benefits, one of which being discovering sleeper or hidden spots missed by most anglers. Jeff Sundin Poll Question April 12, 2018 "Do you regard a 4 fish possession limit as "A Lot of Walleyes?" On Tuesday, I wrote; "Referencing Bemidji Area Fisheries Manager, Gary Barnard's comments about Upper Red Lake Walleye bag limits, I found it interesting that he used the phrase "A Lot of Walleyes" to describe the 4 fish bag limit. April 9, 2018 - Can We Comapare Walleye Spawning During 2013 vs 2018? 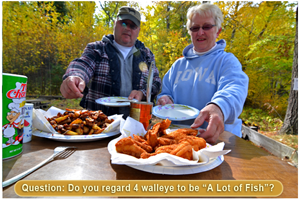 "Q) Alan Kirkpatrick wrote; "Do you happen to remember back to the spring of 2013 and what the dates were for the walleye egg harvest at Little Cutfoot? I am trying to make some comparison to this year's late spring and what will be happening up there, someday soon, I hope. I do realize the length of days for the run, and their stripping operation greatly depends on the given weather conditions of each year, but I'm just looking for a starting date when things got rolling back then. Thanks for your thoughts and time." A) Alan, as a matter fact I do remember that spring and recall that the dates for the walleye egg harvest at Cutfoot Sioux didn’t begin until well in May of 2013. I checked my own reports from that spring and found this one, dated May 13, 2013; “Surface water temperatures hovered at about 45 degrees today, warm enough to trigger a full scale spawning run. In fact, within one day of ..." Read >> Can We Comapare Walleye Spawning During 2013 vs 2018? March 28, 2018 - "Muskies, Stocking and Ideal Habitat"
On March 27, 2018 Tim Olson wrote; “Jeff, following the discussion about muskies and musky stocking, I see some folks referencing a supposed relationship between muskies and a decline in Northern Pike populations and/or spawning success. Are you aware of any direct relationship between the two? Also, I’m wondering about your take on the new pike regulation that will allow a 10 fish limit for northern Minnesota? March 2, 2018 - "Ice Helix 7, Adjusting Backlight To Conserve Battery Voltage"
Wired2Fish February 27, 2018 "Is Side Imaging Fish Finder Technology Right for You?" "There's still uncertainty about side imaging technology and if it's worth it. 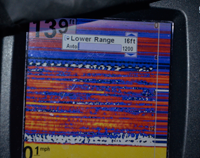 We let the imaging do the talking and let you decide based on fishing style and budget. The goals of this video are to 1) prove that side imaging technology produces highly detailed pictures far off to the sides of the boat, and 2) help you decide if this technology is right for your fishing situation. To accomplish this, we filmed on an ultra clear lake and drove a shallow rock flat covered with boulders and also containing sunken boats and tires. An in-boat camera was focused on the fish finder screen while a drone flew overhead (synched with in-boat camera). Jeff “Kolo” Kolodzinski simply drives the structure and ..." View Video To Learn More >> Is Side Imaging Fish Finder Technology Right for You? Bunk Trailers vs Roller Trailers; Which Is Best? Q) "Jeff, What kind of trailer do you prefer, a bunk or roller? A) Steve, if I was assured that every landing I would ever use had water depths adequate for floating my fiberglass 208 ProV, I would absolutely prefer bunk trailers. Bunks provide better support for my hull and given that I have enough water to float my boat, the bunk trailer is an absolute dream to load. Hands down, the bunks are a better way to go, when and if they suit your needs. They do have one drawback and it’s a big problem for me because not all of the public access sites at the lakes I fish provide water that’s deep enough to provide adequate flotation. That's why I still ..." Read >> Bunk Trailers vs Roller Trailers; Which Is Best? Pete Mayer wrote; "I read your article on Thursday about controlling a tiller boat in big waves, it makes sense, but not all of us are lucky enough to have a boat like yours. So my questions are do you really need a tiller boat and what would you do in these situations if you didn’t have one?" Okay lets cut to the chase. If you've ever asked a question about using side imaging, how it works or why it works; then you need to watch this video. This is the most comprehensive turorial about using side imaging technology that I've ever seen. "I’m just like you, I wish that I could visit my favorite lake any time I want and catch oodles of big Bluegills. I’d like to bring a bunch of them home too, that way I could fix a big family fish fry for every special occasion. The problem is that if I fish there too often or bring home too many fish, my favorite lake won’t remain favored very long. It’s a fact of life and we’re going to have to come to grips with it; as a group, we are extremely effective predators and we’re getting better all the time. We have the equipment, the knowledge, the leisure time and the communication skills to harvest fish faster than our favorite lakes can produce them. We literally have the ability to ..." Read Article >> What Is The Value Of A Sunfish? Fish ED New Video March 2, 2017 "How Zebra Mussels Affect Fish Location"
"Exotic Zebra Mussels have invaded countless lakes across the Midwest. Ice Fishing Report March 1, 2017 Q&A What's The Death Cloud? Kurt Anderson Asked; what do you mean by the term “Death Cloud”? I saw your fishing report dated February 27th and in it, you said; “I was surprised that the action stopped before sundown, but it did. By 6:00 PM the screen of my Humminbird was painting images of the “death cloud”. A) Kurt, I coined the phrase “Death Cloud” before I ever ... Read >> What's The Death Cloud? ... "This probably means that for most fishermen, "The Turnover", I mean the absolute scientific event is probably not really what influences fish locations and feeding patterns during the cold water period. Most of us rarely, if ever see surface temperatures colder than 40 degrees and for me, 50 degree water is enough to produce changes in both location and feeding patterns. In other words, it's the fish that force me into finding alternative locations and feeding patterns well before the scientific version of turnover actually occurs. Did you know that the Thursday Morning Program is available for 2 weeks after the air date? Yes, if you miss the live show, just click here and select the 6:00 hour on Thursday. Scroll in to about 6:20 AM and you're back in business! Oh, And Do You Know that you can even post your own helpful hints to my fishing reports page on facebook? YES! You Can! You don't have to tell us your secrets, just go ahead and brag a little when you get a whopper! >>> Click Here >>> Fishing Reports Minnesota .